Download the participation certificate for 2018’s contest. Carefully print it out and write your child or student’s name in. Green web hosts exist! iPage (check review) is powered by green and renewable energy so that your carbon foot print is smaller! Thank you Stan Eason for this video of the “Frogs and Their Threatened Environment” exhibition, May 2015 in Jersey City’s City Hall Rotunda. The video below showcases Spring 2014’s exhibition at The Distillery Gallery of international frog art by children aged 3-12, from more than 27 countries. The exhibition was well attended and a special thank you to Mayor Steven Fulop of Jersey City and JC1TV for helping broadcast this issue. Now that all the winners have been announced for 2014 contests, we have scheduled exhibitions around Earth Day and Save the Frogs Day 2015. Frogs Are Green is on an awareness mission to educate the public about the threats to frogs and amphibians. Through blogging, interviews, social media and annual events we have reached a great many people but now it’s time to go to the next level and bring a new curriculum to the schools. photographers and artists, both classical and current. 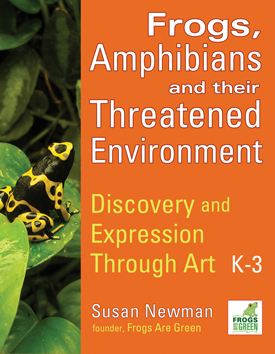 Check out our other books too: Rainforest Frogs and 101 Wallace School Frogs – A Frogs Are Green coloring book! !